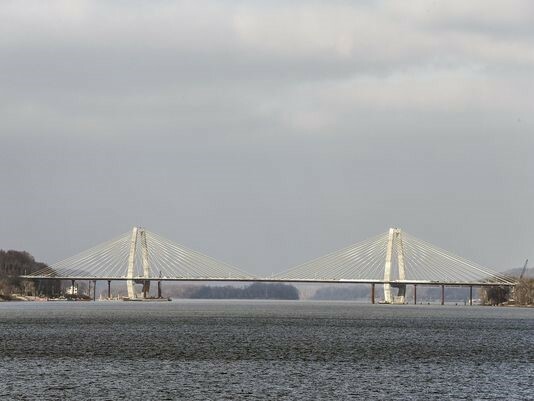 American Structurepoint congratulates the entire Kentuckiana community on the December 18 opening of the new Lewis and Clark Bridge and East End Crossing public-private-partnership project. The $2.3 billion Louisville-Southern Indiana Ohio River Bridges project, which also includes a new downtown bridge crossing, truly is a major achievement 40 years in the making and turns the page on the start of a new era of economic opportunity and cross-river mobility for the entire region. The East End Crossing project covers 8.5 miles of roadway that connects an area just east of Jeffersonville, Indiana, to the eastern edge of suburban Louisville. The Indiana portion extends Indiana 265 four miles to the Ohio River from its previous termination at SR 62. The Kentucky portion extends Kentucky 841 from its previous end at US 42 and includes a pair of 1,700-foot tunnels beneath US 42 and the historic Drumanard Estate. Its centerpiece is a stunning 2,500-foot cable-stay bridge spanning the Ohio River. The bridge also features 2 diamond towers rising 300 feet above the river and a shared-used path for pedestrians and bicyclists. American Structurepoint served as the design firm for Section 6 of the project, which is the portion located in Indiana. The project brings many benefits to the area. Chief among them are improved traffic safety and an anticipated reduction in traffic congestion in downtown Louisville by providing an alternate route for crossing the Ohio River. The new roadways and bridge also are expected to dramatically increase the region’s role in the nation’s freight economy. Indiana Governor-elect Eric Holcomb estimates an economic impact of more than $87 billion throughout the region over the next 30 years. Great things are happening in this area as well as at the nearby River Ridge Commerce Center, the 6,000-acre former Indiana Army Ammunition Plant being transformed into a thriving business and manufacturing center. American Structurepoint is so grateful, proud, and honored to be among the many firms joining together to improve the quality of life in this region. Here’s to continued growth – the best is yet to be.